DrumSpillage by AudioSpillage is a Virtual Instrument Audio Plugin. It functions as an Audio Units Plugin. DrumSpillage 2 is a 16 part multi model drum synthesizer plugin for Mac OS X. DrumSpillage features 12 exclusive drum models designed for synthesizing a diverse variety of unique electronic percussion sounds. 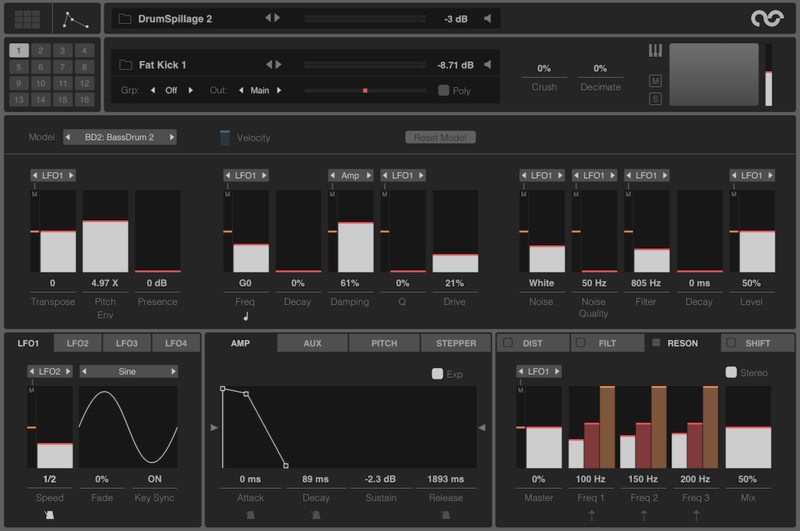 DrumSpillage 2 features a brand new interface and re-engineered DSP code along with a multitude of enhancements including new modulation sources, velocity control, expanded synth models, new distortion algorithms, 3-band resonator, frequency shifter effects and improved sound quality. 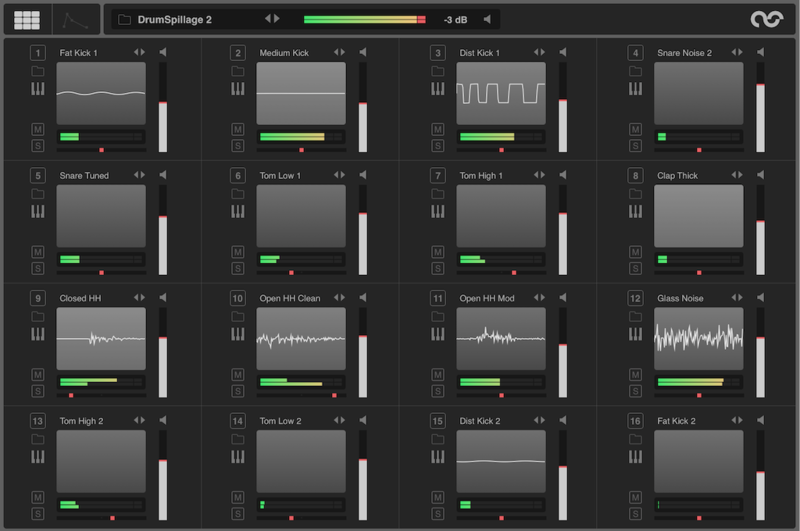 12 exclusive drum synthesis algorithms with extensive editing facilities. Velocity mapping to most parameters. 16 mono or stereo outputs. High resolution 64-bit DSP engine. 4 envelopes and 4 LFOs. Keyboard mode allows synths to be stacked or played melodically/polyphonically. Been on the lookout for decent drum sounds for a while. Been pondering over sample based drum synths, but that felt too limited, I'd like to build them from the ground up. The xox style machines were too limited in scope and it didn't quite click with the sound of some other synths. Enter Drumspillage, I've been using this for a few months now and it really starts to grow on me. To start with the interface, I like it, it's uncluttered, logically laid out and it's just extremely inviting to dive in and dial in new sounds for hours at an end. The more important part, sound, this is were it really starts to shine. It can be as deep, punchy, gritty or gentle as you want it to be. It doesn't impart it's own flavor to the sound, it's actually very clean, which is good as it's my goto drum synth for any occasion. It really sits well in a mix, and doesn't need to have a lot of additional processing. Both the extreme highs and extreme lows are there, undistorted, and without any other artifacts. One thing I really like is how quick you can make a sound exactly to your liking. Let's say you want a typical 808 style kick, the deep, long booming type of kick. Choose one of the bassdrum models, dial in a long release on the envelope, and sculpt it to the finest detail. Want a click? No problem. Want some more grit? Use for instance the FM slightly to give it a more lively feel. It is, in fact, something that sets it apart from the rest. The amount of useful, high quality, sounds you use 90% of the time. Kick, hats, snare, clap? Got it, and delivers with aplomb. Not that you're not able to go into more experimental territory. Drumspillage delivers just the right tools to get those 90%, but offers enough flexibility in its synth models to go (far) beyond drum sounds. See, you have a selection of different models, each catered to a certain type of sound. A model in Drumspillage is just a set of oscillators and noise sources, but all interconnected in a different way. Some offer FM capabilities, others a selection of noise sources, each with their own filters. Don't be fooled with their names though. For instance, I've been able to get a nice tom sound from the Clave model. After the model, you'e able to mangle the sound further with a distortion unit and filter per pad. They'e essential in dialing in sounds, and can be modulated with the envelopes and LFO's. Speaking of which, they're very well thought of. The envelopes are nice and snappy (as they should! ), you're able to set the ADR as note divisions (synced to the host) as well as time. The slope curvature of the envelope is seamlessly adjustable. It really feels like a lot of thought and love has gone into this synth, and it shows. It's full of smart features on both performance and synthesis. If I have to fault it, it would be that at times, I'd wish it had some more modulation routings. All destinations are fixed, albeit well chosen. At heart, Drumspillage is of course a drum synth, making synthetic sounds. Although much to my surprise I have been able to get some natural sounding percussion, toms and bassdrums out of it. But the ability to load samples would have been a great addition. It's available now in Minispillage2, but I hope someday it will make it to its big brother as well. Last but not least, the developer is quick with responding, and even a bug I happened to encounter was resolved within an hour. Updates enhancing the functionality are frequent. I didn't encounter many problems though, and it has been very solid. CPU usage is average, I find it to use about as much as Massive (of course both depending on polyphony). But hey, you can freeze the pads inside the synth! As you could have guessed by now, I'm digging this synth. I think it deserves praise, so that's what it gets from me. And I believe that, if you're on a Mac, you owe it to yourself to at least give the demo a try. Combined with MiniSpillage-2, DrumSpillage is a 10. Alone, it's a solid 9! There have been a few excellent comprehensive reviews on DrumSpillage, so I won't go into detail. But, what I will do is tell you this. ..
DrumSpillage is UNBELIEVABLE and UNBEATABLE for the price. So simple, yet so powerful. It's refreshing to have a drum synth that enables me to create my own sounds by tweaking DSP algorithms. This plugin is extremely easy to use and deep if I need deep! It's also very CPU friendly. I can run a few thousand instances on my MacBook (well, maybe a little less). The only thing missing is the ability to integrate samples and demo beats with a built in sequencer, but have no fear. .. AudioSpillage has taken care of those needs by releasing MiniSpillage 2. I picked up both of these plugins and find them a perfect compliment to each other. I love the GUIs. .. neat, clean, and hi-tech. They work seamlessly in Studio One and Logic. There are no useless knobs and wooden panels and all the other junk that get in the way of creating music! This is the closest thing I've found to having a direct jack into my brain! Thank you so much AudioSpillage for creating stuff that is sonically sweet, fun to use, and affordable. If I had a hat it would be off to you guys! Let's get one thing straight: DrumSpillage is not a virtual modeling Roland 808 or 909. I don't doubt you could come close with some careful programming, but that is not what this plug-in is about. DrumSpillage is all about drumsynthesis. It's got sixteen drumpads, that can be played by clicking them or via midi. Drumkits are assembled by choosing a drumsynthesis model for every pad and edditing the sound according to taste. Every model is specially designed to create a certain type of drumsound like a bassdrum, a snare or a hihat. Because these models are build from components that every synthesist will recognize, like oscillators, filters, envelopes and lfo's it's not hard to start programming these models right from the start. DrumSpillage is a virtual analog drumsynthesizer, where elements like oscillators, filters, envelopes and lfo's are recreated using physical modeling. This is not to be confused with the physical modeling of drumsticks hitting membranes. DrumSpillage is not for realistic sounds. DrumSpillage is for unheard before, and often experimental, synthetic sounds. I think the DrumSpillage UI is an extremely well designed piece of work. It's not only very beautiful, it's also a joy to work with. I would, in fact, like to call it a work of art. It's great! It's quite small, so it does not waste screenspace, but it is not so small that the controls become hard to manipulate. Fonts and colorscheme make everything very easy to read, and everything is just where you'd expect it to be. I do, however, advice you to read the manual, because there are a few tricks in there that you might overlook, and those make DrumSpillage even faster to operate. DrumSpillage is not immitating anything, so it's hard to judge it by compairing it to anything else. However, considering the fact that DrumSpillage emulates analog circuits I would expect it to sound warmer and maybe a bit dirtier than it does. DrumSpillage is clearly a child of the digital age, it's clean, crisp and cold. I do not think that's bad, perse, and you might fix it with some vintage warming plug-ins or running it through some real analog outboard gear. - Every pad can have it's own range of midinotes to respond to (instead of just one) so you can do some melodic stuff with the models as well. - Single pads or complete kits can be exported to audio files, for use in your favorite sampler. - It has a great randomise function, that can be a great help when you're looking for something altogether new and fresh! - It does NOT (I repeat NOT!) have a step, or grid-sequencer. You have to sequence your beats in your host sequencer (DAW, whatever you like to call it). The documentation is well written. I do advice to read both manuals. I did not contact customer support, so there is nothing I can say about that. Only that AudioSpillage was fast to send me my download link and registration codes as soon as I ordered DrumSpillage. The balance between complexity, flexibillity and price is just right, as far as I'm concerned. I pre ordered this plugin and have been using it regularly ever since. I don't buy everything that comes out and I prefer to select tools that I can add into my setup to expand my sound options so when I purchased DrumSpillage I wasn't really attempting to replace anything I already owned. DrumSpillage is a drum synthesizer which means there are no samples at all in the plugin. DrumSpillage gives you 16 drum 'pads' where each pad can be assigned to a different drum 'model'. There are 11 models available in the current version: BassDrum, SynthClap, WoodenDrum, NoiseDrum, Clave, HandBell, Membrane, ElectroBassDrum, ElectroSnare, ElectroHiHat and ElectroCymbal. You also get a distortion unit with six different algorithms ranging from bit crunching to more analog style clipping and a multi mode resonant filter on each pad. There's no reverb, dynamics or EQ processing on board but you get 9 outputs so you can easily route sounds to your favourite plugin or fx unit. I spent the first few hours exploring my new drum synth instrument which for me was very easy to get into having spent a few months working with the freeware MiniSpillage plugin. I was up and running in no time and barely had to reference the manual. I usually start a track with the drums first. Sometimes just a really basic rhythm then I'll add other instruments around that and build up the rhythm track. The first thing I noticed with DrumSpillage was how quickly I was able to come up with original kits. Usually I'll start with a stock sample bank or something I know just to get into things before I lose inspiration. With DrumSpillage I take the same approach but within a few minutes I can really tweak the drums into something new and unique or completely change the character of the rhythm with a few clicks here and there mid track. No sifting through piles of sample banks. The sound quality is excellent. I found the bass drums offer enough clean bass depth to really drive a track which lets face it isn't always the case with software. The drum sounds DrumSpillage produces can really cut through a mix or sit in the background equally well which is important for me. You get full control over envelope dynamics via a dedicated ADSR. The sounds also respond well to external EQ and reverb without losing their character. For a drum synth you get a decent amount of editing potential with 2 LFOs per pad. The distortion and filter units can really help here too. Each model can be edited to sound like something completely different so anyone into creative percussion/synthesis or electronic drums will enjoy this plugin I think. I find myself using the LFOs more and more as I continue learning this plugin and the ability to automate almost anything is fantastic. I'd like to see more models and definitely more presets and maybe I forgot to mention the plugin is Mac Only so far. 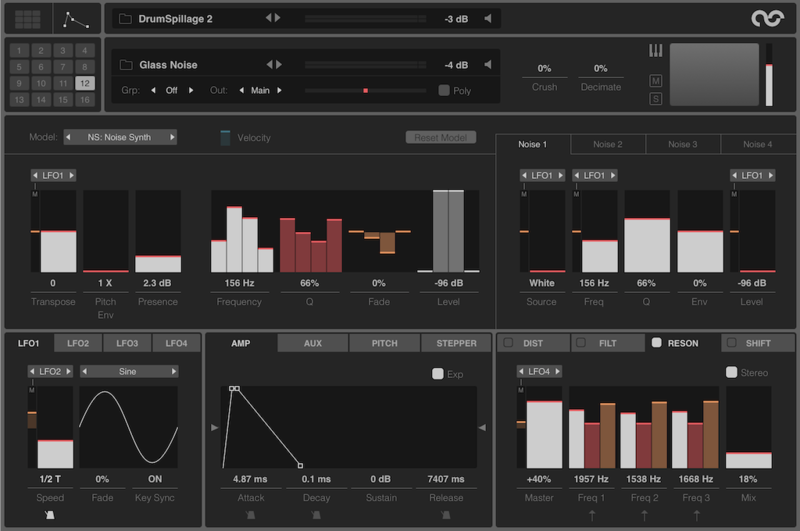 Saying that I can certainly recommend this plugin for anyone interested in electronic sounding percussion tracks e.g. electro, glitch, house, techno, dubstep, IDM, d&b, grime etc. But I also think the quality and flexibility is high enough to be used in other less obvious genres and studio environments and it can hold it's own when used alongside analog and hardware kit.